I was pleasantly surprised by the fit of this bespoke suit from Dalcuore in Naples, given I was a new customer and they were happy with just a single fitting. The jacket was a great fit straight off - clean through the chest, perfect on the shoulders, waist and hips. The collar could be a touch tighter (it stands away a little more than it has to when I lean or move) and the sleeves a centimetre longer, but that's about it. Dalcuore's style is pretty standard Neapolitan: soft, natural shoulder; 'shirt sleeve' attachment to that shoulder; rounded fronts. But there are some small differences from others like Solito and Caliendo: the jacket is a tad longer, and the fit a little less close through the waist. It feels easy, but elegant. We had some issues with the trouser fit - they were too tight through the seat and thigh, and the end of the waistband wasn't closed properly. This should have been easy to correct, even remotely, but in the end it proved rather difficult. I sent the trousers back in the post, and detailed the issues with photos to illustrate. When they returned, the waistband issue hadn't been corrected and the fit was a lot better in the seat and thigh, but now a little too big in the waist. Dalcuore suits are well priced, at 3000 euros sitting between the cheaper Solito (2500) and the more expensive Caliendo (3500). The finishing is also good, and as long as they visit London fairly regularly, I'd recommend them as a good Neapolitan option. They are back in London from June 30 to July 3, with the last visit during February. It's hard as they are currently travelling to more than a dozen countries worldwide, but I have suggested that it would be helpful to come a little more often. The material is dark-brown Crispaire from Holland & Sherry. Regular readers will know how fond I've become of this cloth, and I think it is particularly sharp in a dark shade like this. It's not an easy colour to wear, but I find colours like greys and black work well in a tie, with a white or very pale blue shirt. The tie pictured here is an untipped, houndstooth wool from Drake's. The handkerchief is from Etro. And I'm wearing my bespoke imitation wing-tips from Cleverley. These images were taken for an upcoming campaign for Frank Clegg bags, hence the presence of a Clegg bag in almost all the shots. 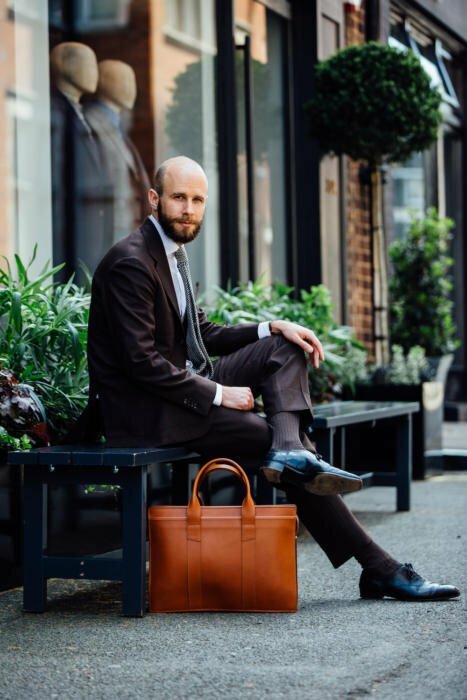 The brown bag is the Birmingham Briefcase ($990) and the tan the Zip-Top Briefcase ($1,135). You can follow the discussion on Dalcuore bespoke brown Crispaire suit by entering your email address in the box below. You will then receive an email every time a new comment is added. These will also contain a link to a page where you can stop the alerts, and remove all of your related data from the site. are you going to write an in-depth piece on the bags? They look nice. The suit looks good, do you think Dalcuore’s value for money is better than Solito’s? Perhaps, yes. Not quite as frequent visits, but certainly better finishing and perhaps fit. I’ve written about Clegg a few times before – but can certainly do more if there are specific questions? Couple of comments. The coat looks a bit on the short side, so the buttoning point looks high on your waist. Also, in the last shot but one the stitching on the trouser hem is very visible, which is a shame. Overall, I like the choice of colour, and again it appears very suited to the environment in Southern Europe. Thanks Nick. As per usual, I don’t think small things like the button positioning can really be judged from these images. Hold the camera a few inches higher, and the positioning looks different. Rather than over-stage such shots, I think it is better to rely on my own experience and analysis. In this case, the button positioning is actually a tad lower than the other Neapolitans. And the trouser hem is no more visible than on any other suit – the contrast of the light in that setting makes it seem so. Thanks Simon, but the comment on coat length was more to with the bottom hem relative to your hands. That determines the proportion, so lapel length, position of pockets, and therefore buttoning stance all flow from that. I partially disagree here, generally I find the hand a bad indicator of the appropriate jacket length. Individuals simply differ too much on this proportion. I think the jacket length looks quite fine on this suit. However I do agree the button stance looks a tad high on the waste. I would probably have preferred the buttons lowered about half an inch, then also the lower button would align with the pocket edge. But I also understand the effect of the field of view and the angle of the camera could be causing some the effect. Nice to see suits in something other than blue or grey. I have not ventured this far but have considered it many times. I have been looking at palewear as an option for weekend wear (just had trousers made in beige using H&S Crispaire but did not go for the coat). These colours are used by the Italians in summer to great effect which is beautifully set off by their skin tones! Any thoughts on this – perhaps you are even thinking of having a suit in this colour wave? Fantastic post, lovely suit. How does the fit and finish compare with Caliendo? I have just had my second jacket made by Elia in cream Irish Linen and I’m always impressed by his knowledge and attention to detail especially that he doesn’t make the jackets too tight as the trend is nowadays because he likes to have maximum movement and room for thicker shirts etc. 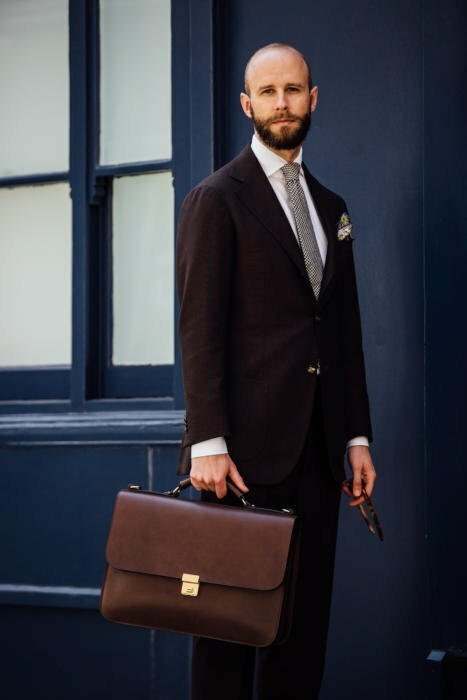 Simon, Firstly a great blog, and you have contributed so much to the world of tailoring. On your new suit though I feel a few things: the chest could have had more volume, and the lower button could be lower. In the frontal photo, it seems the jacket is pulling up and exposes your shirt. The trousers/jacket balance seems a bit off – the trousers are baggy (witness the fold on the inside), and the jacket seems too small. All meant to be constructive in the hope of reaching the final goal you support so well. Thanks Peter. Absolutely taken in the right spirit, however as I always say you can’t analyse these things from online images. We took about seven shots of those side-on looks, and in every one the fit looks a little different. Stance, a breeze, anything. I would suggest the bottom of the coat should finish an inch or so below the bottom of the fly. This would add length to the lapel, lower the buttoning stance, create more snap, and give a fuller chest. But that is only my personal preference, and it is that freedom and flexibility that makes bespoke so special. Finish is all important, but the beauty of it is that bespoke makes it yours. I think this looks great. For shoes, do you think a softer last would have been more suitable? Great blog Simon. I’m also looking at the bags but trying to choose between rather formal attache cases and briefcases is quite difficult. 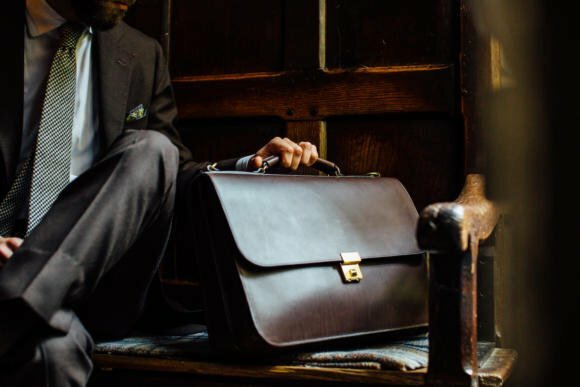 In terms of craftsmanship for briefcases where do you see the offerings from Cleggs compared to English brands/manufacturers eg Dunhill, Pickett’s etc? The craftsmanship isn’t that different, but the leathers will be. Clegg’s are all veg-tanned and usually unlined, and i like that. Hi Simon, lovely suit as always. Do you think brown is a suitable colour for conservative business wear or would you stick to the oft-bandied no-brown-in-town maxim? The maxim is largely irrelevant here. It referred to wearing country clothing in town, which was tweeds, much more casual shoes, etc etc. It should be taken as a reminder to dress for the formality of the occasion. Not to rule out brown at all. That said, despite the darkness of this suit, it will always be slightly unusual in a conservative business environment. In the way that anything other than a grey or navy single-breasted will. If anyone is wearing anything other than that, and it is fully accepted, then yes this brown could work. Nice suit ! I had the measurements in June and the first fitting comes in July. It will be a double breasted 6/1 with very large lapels. I really like this shade of cloth. At what ‘number suit’ would one normally have before commissioning in that colour? I have had a navy and charcoal made (and should get the call for the basted fitting on a mid-grey quite soon) but interested to hear your thoughts if other colours are more versatile before going for browns. Enjoyed seeing Bruton Place in the backdrop of the photos! Interesting question. Depends on your life, work etc, but I guess could be no.4 or 5? Simon–this looks absolutely smashing, there is no way around it. I can see why some of the commenters might flinch at the jacket length, but they shouldn’t. It is a matter of interpretation on the tailor’s part, and the overall effect is stunning. Nice suit, I like shoulders and the way the lapels and gorge relate to the shoulder line. The lapels look like they might be pulling a little bit in the top picture but the fit looks spot on in the other photos. Interesting autumnal brown. The colour will suit some people better than others, it looks very good on you. The dark brown bag matches it perfectly. Just one further comment I would make: the black shoes don’t fit in. Doesn’t fit with the rest of the leatherwork. I would argue the case for brown shoes with a brown suit is far stronger than brown shoes with a navy suit! Trousers are interesting – perhaps a little too generous around the knee? Or is it just a result of the problems you mentioned in your post? could you please recommend a maker to me with respect to belts? I am looking for a classic belt to wear with a dark suit. All the (very) usual suspects like Prada, LV etc. have those. Would you recommend one of them? Or would you suggest a different brand? Ok— i will use a rope in the meantime. Other than the new maker you mentioned would you care to let me know a few more brands? I understand this is a shallow question for a day as this day but for example I thought that LV started out as a saddle-maker so I (wrongly?) assumed that their belts would be self-made and of high quality. Unlike, for example, sunglasses or watched or any other item a label would simply slap their logo on. Unfortunately no, Anton. There is very little they make themselves – pretty much just the hard-sided cases. And on everything you are paying a large amount for advertising, marketing, fashion shows etc. This is an altogether off-topic question. I just wonder wether the Brexit won’t anyhow impact PS’s workings and the menswear industry. Well it’s got me pretty depressed. But apart from that, I don’t think so, no. We are a very international business and deal with the EU, US and Asia. I think it will have the most effect on majority UK businesses. And of course the economy as a whole might affect everyone. As a Canadian I was very much looking forward to buying UK made shoes and other things at lower tariffs under the Canada – EU trade deal. With the UK withdrawing from the EU, and therefore that trade deal, I probably won’t be buying those shoes now. Unfortunately the UK accounts for a very small portion (under 3%) of Canada’s total trade. A deal with the UK is likely to be very low on our list of priorities. I wondered more how it would affect small EU merchants who do business in the UK. Companies like La Portegna, or traveling Italian tailors. Remains to be seen I guess. I suspect that while it won’t kill this, it will make it somewhat more difficult and expensive for them; I would not be surprised if these tailors start traveling to London less frequently. Fair point – though that depends on what new trade deals are negotiated. Also if the pound stays depressed, it might make British goods more attractive to foreign customers. Again, there is probably no proper place to put this post.. but a few weeks back, I commented that there may be a project in helping Ginan Ganesh at the FT in the area of suiting/footwear…I am now watching a video on the results of the referendum, and I see Lionel Barber is now sporting burgundy cowboy boots with a suit and tie. The button stance is too high, the trouser rise is too short as is the entire jacket. That a suit costing as much as this should fit so poorly even with only one fitting makes me want to stay with my local Italian 73 year old tailor from Sicily who charges me $850 CAD ( about 560 Euros) to make up a suit if I provide the cloth. The suit is mostly handmade and the quality is excellent and the fit is spot on unless I have gained or lost weight. Lifetime adjustments/alterations are included in the price. Walter, where in Canada do you live, and can you share your tailor’s name? Your happiness with your tailor is encouraging Walter. We have one in Edmonton who charges a similar price. I haven’t tried him and suspected the price was a signal of low quality cloth or other shortcuts. I think i’d better visit him and take a closer look. The 3d photograph uses the view perpendicular to the picture plane. At such a point of view on the subject of its width can not be subject to distortion. Hence the trouser width corresponds to that which exists in reality. As per my experience your trousers width poorly correlated with the parameters of the jacket. And if there’s a breeze? Seriously, there’s always going to be minor distortions – the camera is only level with part of the trouser; every lens has a slight fish eye effect; stance and movement etc. The more interesting question is, if I say you cannot tell bespoke fit from these straight-on photos, is there less point in a bespoke fit? Being that this is summer outfit can you tell us what is material of the socks? Do they feel cold or do you sweat in them. 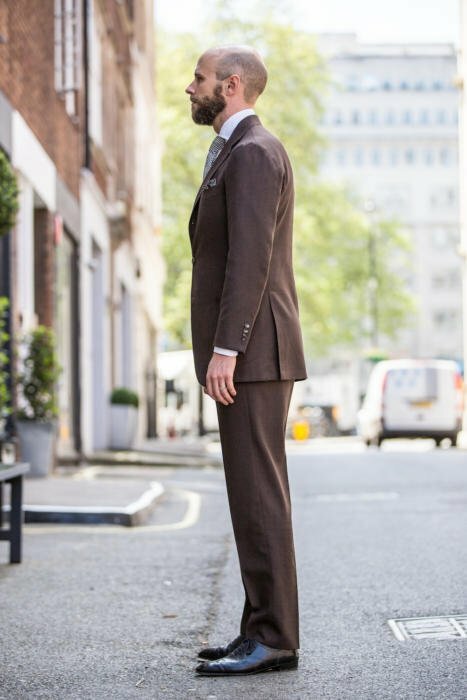 What color of the shoes would you aletrnatively pick for brown suit (I dont think black is the best option). Lightweight cotton. They are relatively cool but I do sweat in them – as I would in anything. Beautiful Simon. Love the colour. WALTER SICKINGER, Braddock, there are several excellent Italian tailors in Toronto. While they can be found throughout the GTA, there are a few concentrations, along Davenport, or in the periphery of “Yorkville”..
All seem to do an excellent job, and respond to, as we input personal details.. I recommend Jean-Paul Lo Giacco at Ermanno’s Clothing…. In virtually all cases, the Toronto shops do all the work in – house…. ANM, thank you for your report. Thank you Ann for mentioning me. I can’t answer your question as the point is not clear for me. I agree an distortion possible even with the view perpendicular to the picture plane (fish eye effect. etc.). But, in that a case jacket parameters (width particular) are also distorted! 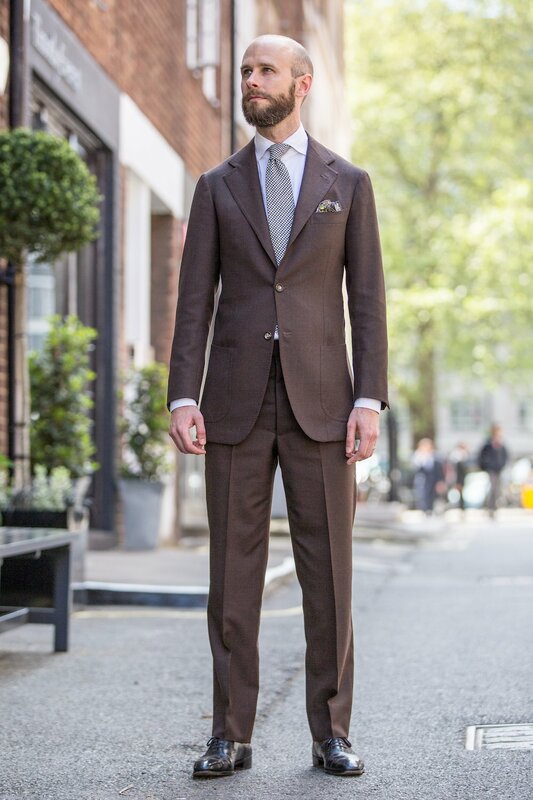 The ratio between the jacket and trousers width as objects remains unchanged and not subject to distortion. That’s why person’s face can be identified even in the room of distorting mirrors. Simon, which must will height socks for suits? The suit looks amazing. Is this from their Crispaire bunch, more precisely HS1733? Is this fabric the 337045CP? The jacket, not so much. Crispaire is too sharp to really work as an odd jacket, for me. But something in a similar colour with more texture, as it sounds like your linen/silk blend might have, could work. How much do you think is a suit if I have it made in Dalcuore’s atelier in Naples? Seems like a convenient option with all the Easyjet flights to Naples. hi Simon, it is always a pleasure reading your blog every now and then. I am based in China and the bespoke trend here is growing stronger every day. However, unlike Naples, most of the tailors here have no concept of the soft style, things like Neapolitan shoulder and double pleated trousers with two straight creases going down the legs. Heavy sigh. I often buy RTW ambrosi trousers and somehow they fit amazingly well every time. I guess there is a reason for his growing reputation in China. The thing is I am planning to have some mto trousers or bespoke trousers made from dalcuore, but i have no idea how good their trousers are, in terms of shape and handcraft. I read your blog about rtw ambrosi trousers and it seems that you had some issues with them. I am wondering if you can compare ambrosi trousers and the dalcuore trousers for me, from the angles of shape and anything else you want to mention. Also, would you recommend MTO dalcuore trousers or bespoke trousers? The price difference is very small but the bespoke trousers will take around 6 months to complete. I would go with bespoke, particularly for a first pair. There isn’t much quality difference between the two, or much in terms of shape either. Try Dalcuore and see how it goes. Hey Simon, 2 years after this post and I’m just wondering how often have you put this suit to use? Do you find them at use pretty often, or have they become something harder to dress up and down and only be able to get a monotonous combination? I also saw you answering some questions in regards to them being separates, would Fresco, in the exact colour have a higher chance of being used as an odd jacket? Many thanks. It hasn’t been worn that often, not because of the lack of combinations but because it’s just that little too unusual for a standard business suit. For a sports jacket, how would you say Dalcuore differs from Caliendo and which would you choose? Dalcuore tends to cut a roomier jacket, slightly longer, more drape. Not a lot, not as much as the English, but noticeable. There’s not much to pick between them in terms of quality, but I’d likely choose on style, plus Elia is in London more often and more regularly. Hey Simon, it looks like the cloth number from H&S has been updated. Would this cloth be the current #337045 or the darker #337046, and if you had the chance to pick again which shade of brown would you choose? So recently planned on getting married in a suit very similar to this, just in Minnis Fresco. I’m aware it’s definitely not a traditional choice but fits the brides requests for not my usual navy or grey and I didn’t mind it too much since I’ve always felt confident in Brown since it fits my complexion nicely being Hispanic. My concern is since this will be a summer wedding I’m trying to find an outfit that would work best. I have a wool/cashmere POW tie somewhat similar to this from Drakes but I associate it with fall and winter. I like the Tom Ford tie your friend wore to his wedding but not sure it will work as well with brown suiting. For the rest of the outfit I’m using a White shirt, black Oxfords, white linen square, vintage watch and some fresh small flowers right through the lapel buttonhole. Any tips Simon? Simon, Thank you for this review. Very insightful. I’m considering both Dalcoure and Pirozzi for a pair of business suits. I am trying to find something which balances well the classic Neapolitan style signatures with a bit of structured-ness as I am trying to capture a hint of British seriousness and also am trying to build up my upper body in appearance slightly for a more powerful overall impression. I would also like a fairly modern silhouette and moderately snug fit. Based on these requirements, would you have a preference for one of these two tailors over the other? Simon could I ask for your advice on a decision I’m about to make? I am about to commission my next suit. It will be used primarily for business and will complement a fairly decent existing wardrobe of a gray, navy and PoW summer weight, navy and grey mid weight, and grey and navy winter weight suits. I would like to get something in mid or dark brown, around 9 or 10oz, plain or subtle pattern. I have been eyeing off the Crispaire you used a couple of years ago as one option – have you used it much? Is there anything else that springs to mind that may be a good option? My office isn’t too conservative so I could get away with some less conventional options. Many thanks in advance for any advice you can share. Thanks Simon – curious how different this dark brown Crispaire looks inside and outside – are the outside shots a little overexposed in these pictures? I’ve been needing a suit to wear to work on hot days (often over 30 degrees Celsius). It is a casual office (I’m one of only two who regularly wear suits) so I don’t need the most formal suit usually. But I occasionally have outdoor events in the heat where I might be meeting dignitaries, making a presentation, etc. so I’d like a suit that can dress up to look sharp and professional. 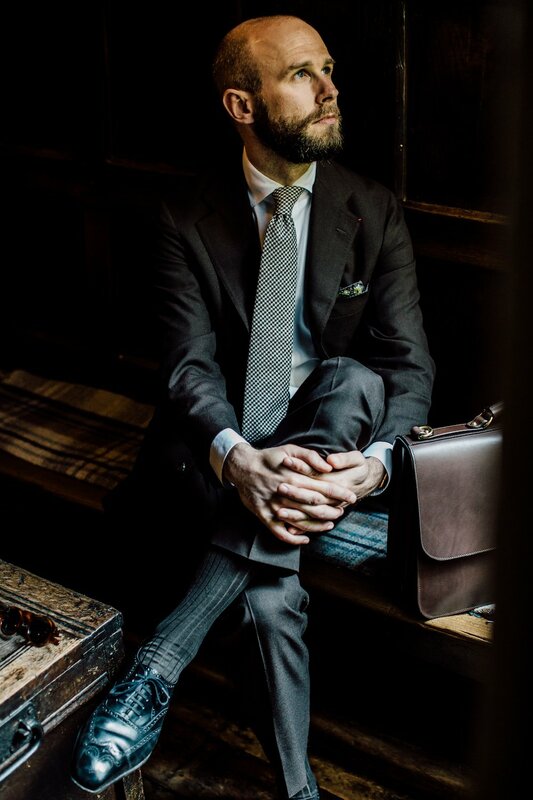 I have the rare opportunity to get a suit made by a neapolitan tailor whom I believe you don’t have any experience (Pino Peluso), but trust the positive reviews of others and think they make sense for a lighter suit more appropriate for heat. – I’m unsure of which weight to get. Should I stick to 11-13 oz? Or lean a little lighter for summer heat? – single breasted, 3 roll 2 design. I like the style. – flap pockets. I note that you seem to get patch pockets with most of your Neapolitan suits (this Dulacore, your Panico, Ciardi, and Pasinato). I assume that’s because you have plenty of office suits and just want more casual suits? Not because a Neapolitan cut is best with a patch pocket? – the tailor apparently doesn’t like a spalla camicia with a business suit, so it will likely be a more structured shoulder, which I think makes sense given my intended use. Any thoughts or advice would be most appreciated. It sounds like you’ve made some very sensible and logical choices. I’d agree with all of them, including the flap pockets. On the cloth, lighter weight like 9oz is OK if heat is a big priority and particularly if it’s a high-twist cloth. Thanks Simon. Very much appreciate your willingness to provide individual advice like this! I am considering a Clegg bag and have been debating between the Wall Street and the zip-top briefcases. I’d use it for business mostly but would like something versatile if possible. I work in finance. It seems to me the zip-top could fit the bill a bit better although the Wall Street is perhaps more timeless. What are your thoughts? You wrote i another post that you haven´t used this suit so often. I am thinking about a “summer suit” and is thinking about something in crispaire or fresco. The most versatile would would probably be a mid-grey (I have too many navy suits) but I am thinking about brown as I already have a quite light-weight grey suit. Another option would be a tobacco brown linen, but I guess that is even less versatile. Do you have any advice? I feel Dalcuore and Solito are very similar in their cuts – what are your thoughts on the matter? I see. Would you say Vestrucci has more drape and fullness than Dalcuore? I assume Panico has the most drape then Ciardia, follows by Vestrucci? Over the course of reading your blog, I’ve realized how appealing chest fullness and drape is compared to a tight, clean chest., especially when your own chest isn’t hugely muscular. The latter also is more likely to have an U shaped silhouette in the chest if it is too tight. Yes Vestrucci has a little more. But none of these are going to compare to an English tailor like A&S or Steven Hitchcock. For these Italians, just asking for a little more room in the chest will be as much as you’ll get. Thanks for the info. Really like the chest of the Vestrucci – the slight concaveness of the lapels are also very sharp. What is the most your favorite Neapolitan’s house?